Thanks to 911maps.wordpress.com, download kml and explore using Google Earth. Not all camera locations are mapped. Report concerns to matt -at- 911conspiracytv. 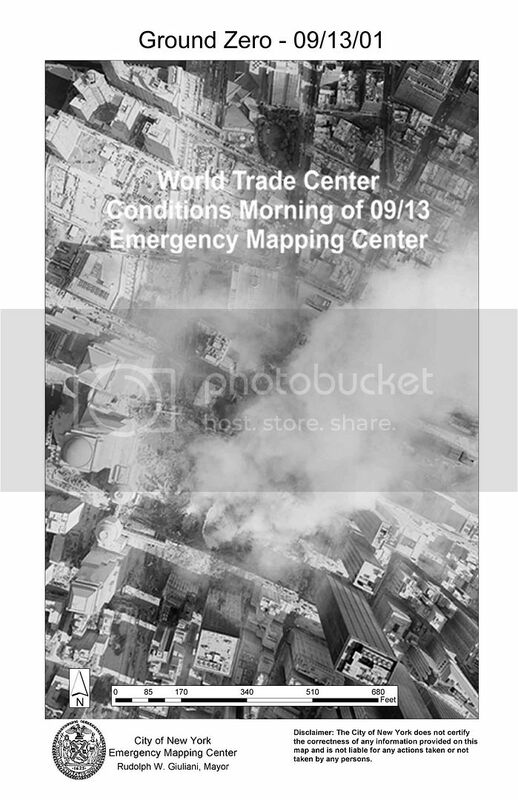 9/11 at 8:46 a.m. Three cameras recorded the plane. Four if you count the mic of one. 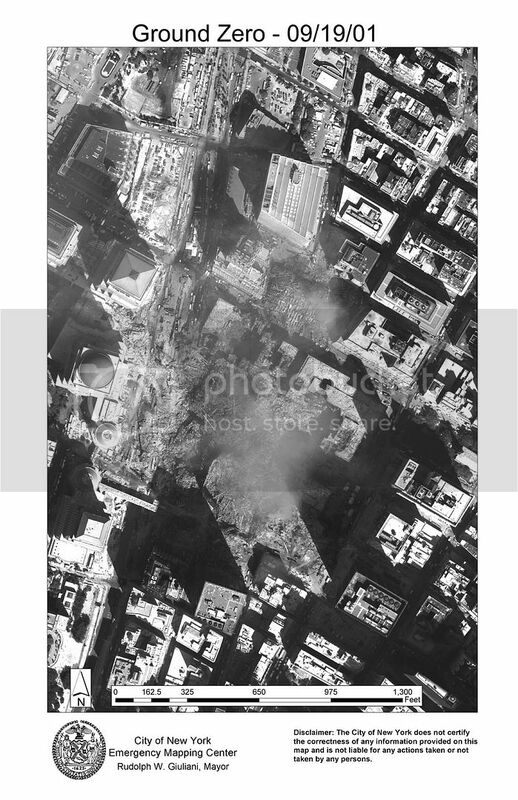 9/11 at 9:02 a.m. 61 video cameras captured the plane. NOAA New York Helicopter Route Chart, seen in part. Click for full version dated and stamped 1988. Adds new insight to media helicopter behavior. 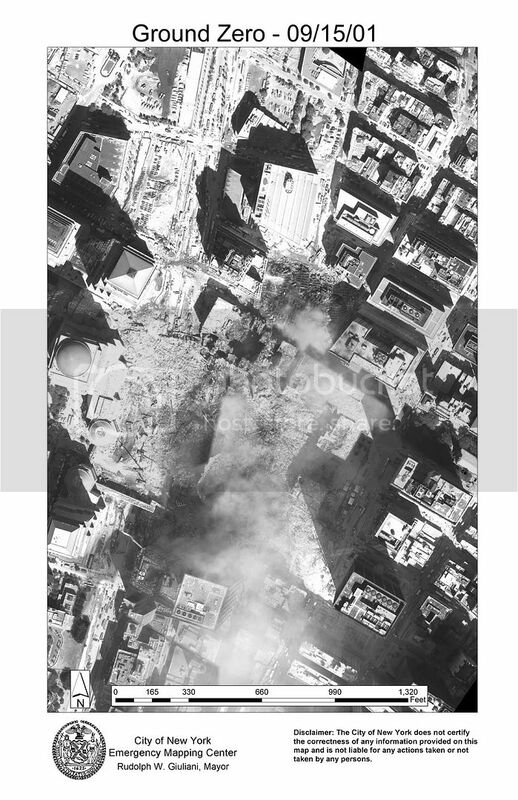 9/11 at 9:02 a.m. 40 cameras recorded the plane in still images. 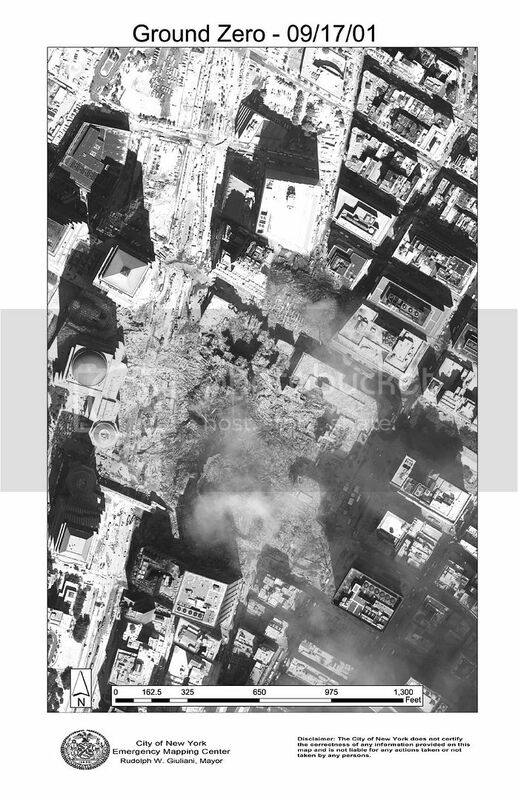 9/11 at 9:59 a.m. 143+ cameras captured the South Tower's demise. "the most complete mapping of the actual WTC Twin Towers collapse dynamics available anywhere." 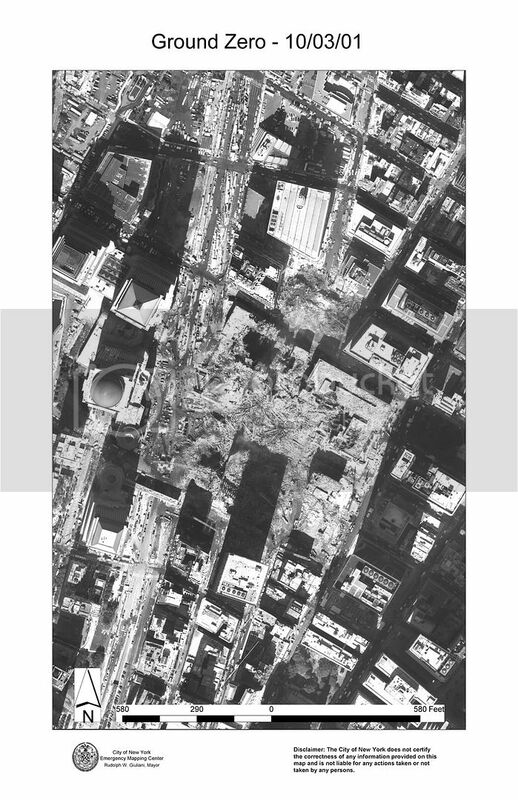 9/11 at 10:28 a.m. 185+ cameras captured the North Tower's implosion. 9/11 at 5:20 p.m. At least 25 cameras caught WTC7 imploding. Special thanks to Aldwinn and Google Earth (see data spreadsheets), YougeneDebs, and Achimspok for their work finding camera locations. 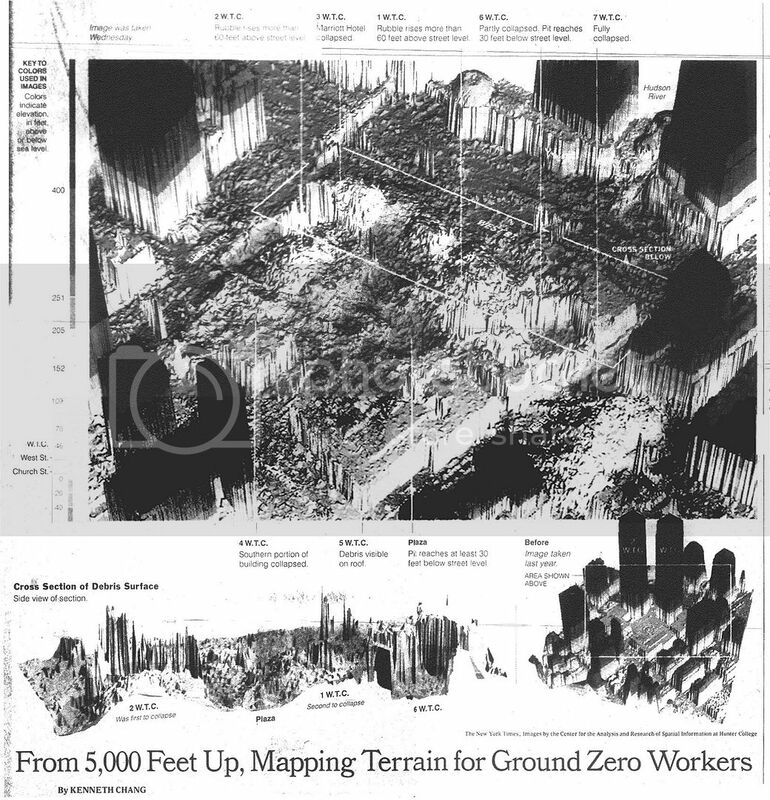 The Sunday Sept. 23 New York Times ran an article titled "From 5,000 Feet Up, Mapping Terrain for Ground Zero Workers," which featured a large LIDAR image taken Sept. 19. Compare to another taken Sept. 23 (source, credit NOAA/U.S. 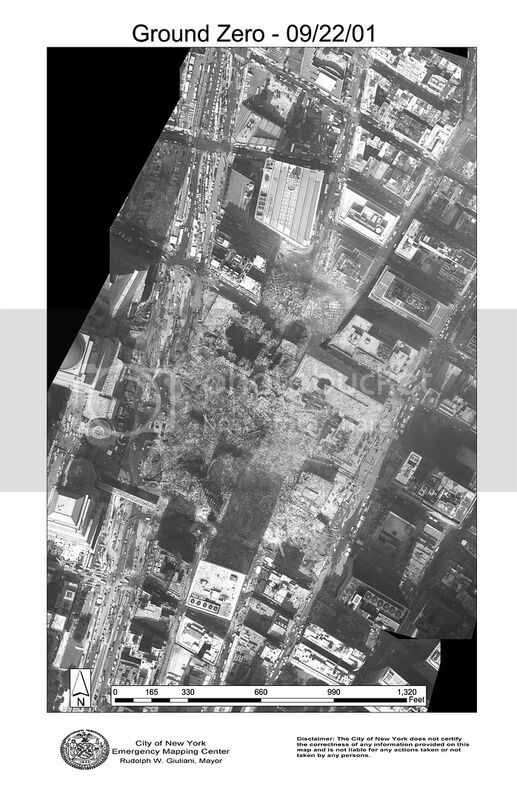 Army JPSD) and another, high resolution image dated 9/17 (credit EarthData, source: 911datasets.org Nov. 17, 2010 NYC OEM MAPS FOIL). 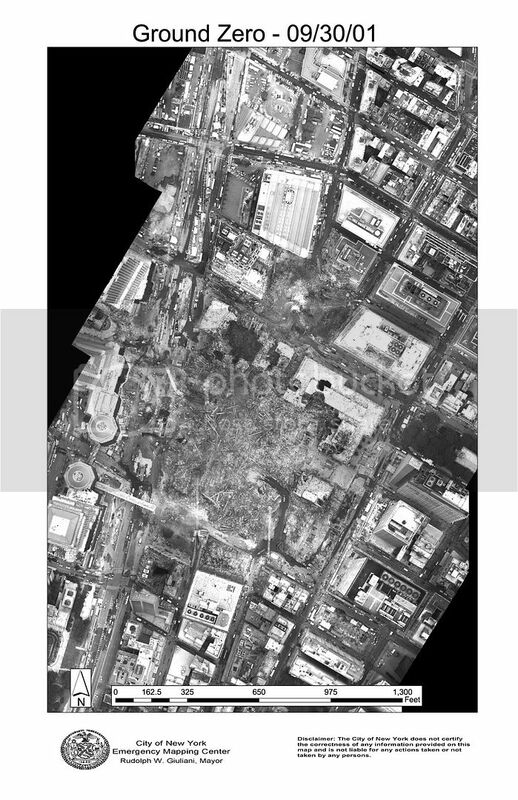 Much more on mapping Ground Zero can be found at The George Washington University website. Notice the importance of the U.S. Army Corps of Engineers, who in the quote below attest to the importance of LIDAR. 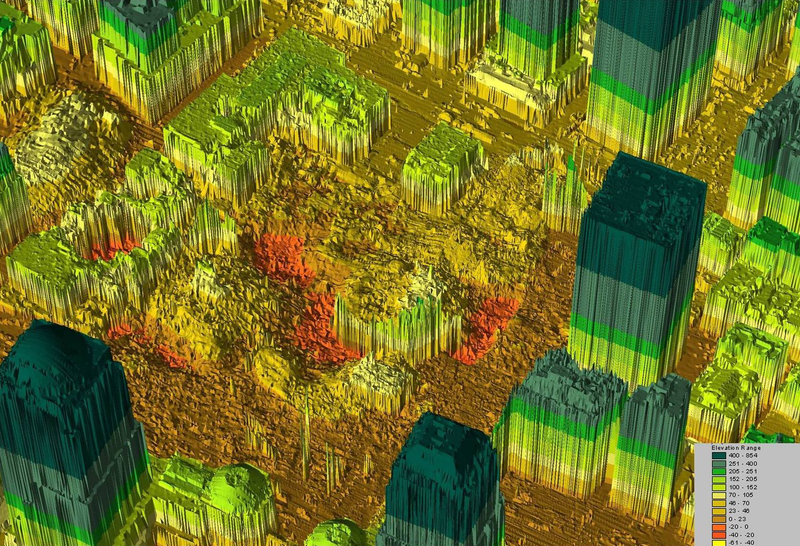 "GIS maps are created from aerial photos taken daily at the World Trade Center site. A light detection and ranging system takes photos that scan the area to pinpoint exact elevations." 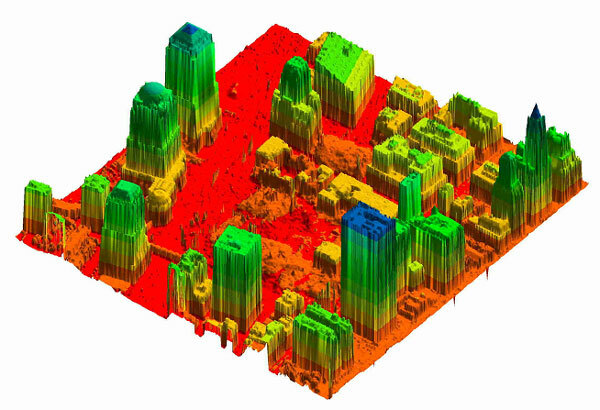 - Justine Barati, "Corps Assists FEMA and New York City with Mapping Capabilities," Yankee Engineer World Trade Center Edition, U.S. Army Corps of Engineers, New England District. Dec., 2001. p. 9. Of course more conventional photography was used. 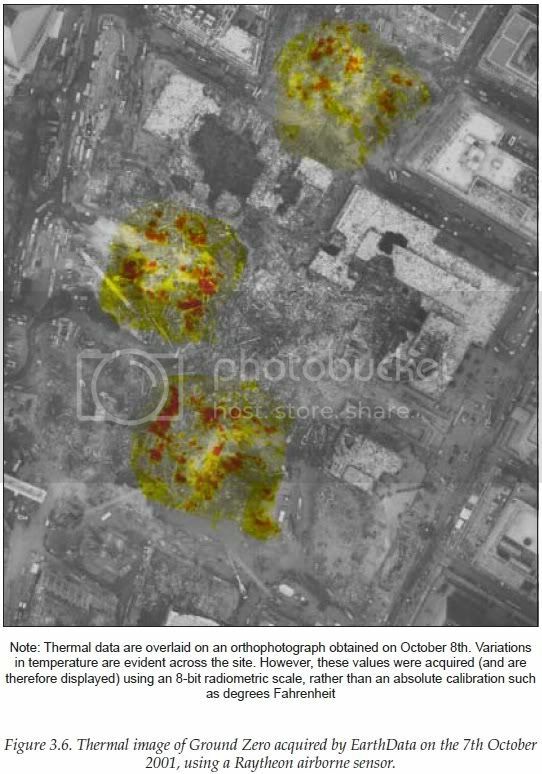 Compare aerial images for these days: 9/13, 9/15, 9/17, 9/19, 9/22, 9/26, 9/30, and 10/3 (source: 911datasets.org Nov. 17, 2010 NYC OEM MAPS FOIL, credit EarthData). It's a shame black and white was used by EarthData (See Charles K. Huyck and Beverley J. Adams, Ibid., Section 3.1.3. "Problems"). - source - Charles K. Huyck and Beverley J. Adams, Ibid. AVIRIS also had the ability to measure and help track airborne pollutants, primarily the carcinogen asbestos. 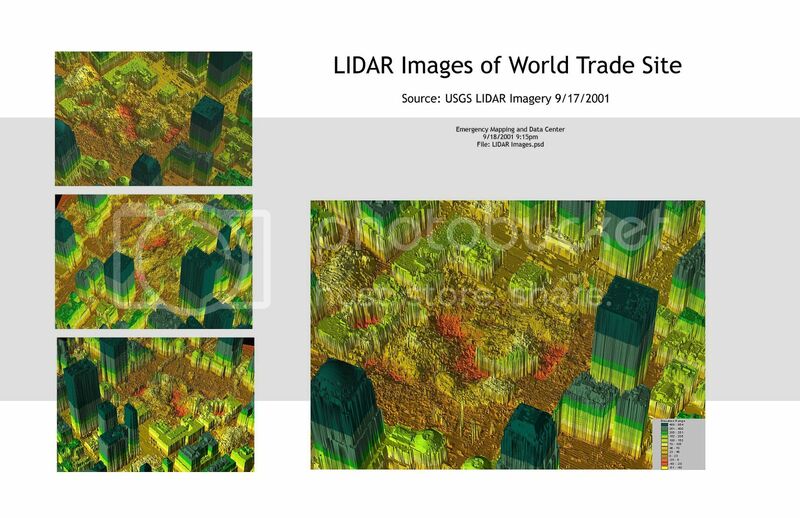 See the USGS PDF document "USGS Environmental Studies of the World Trade Center Area, New York City, after September 11, 2001." Unfortunately, there were "considerable time delays" in getting resulting info. "These compositional results were not released until the 27th September, by which time the risk posed to response crews by airborne contaminants had abated." (Charles K. Huyck and Beverley J. Adams, Ibid., p. 26.) This important issue is discussed in the chapter "Dust." Let's move on to the usefulness of high tech imaging as it relates to the original purposes of this paper. A significant amount of attention was given to measuring the debris mass and volume. 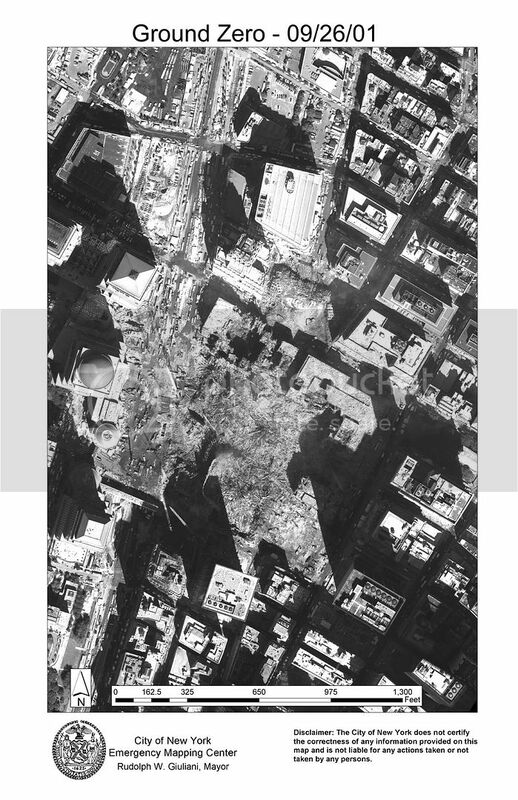 The number of tons of debris removed was often mentioned in reports about Ground Zero. 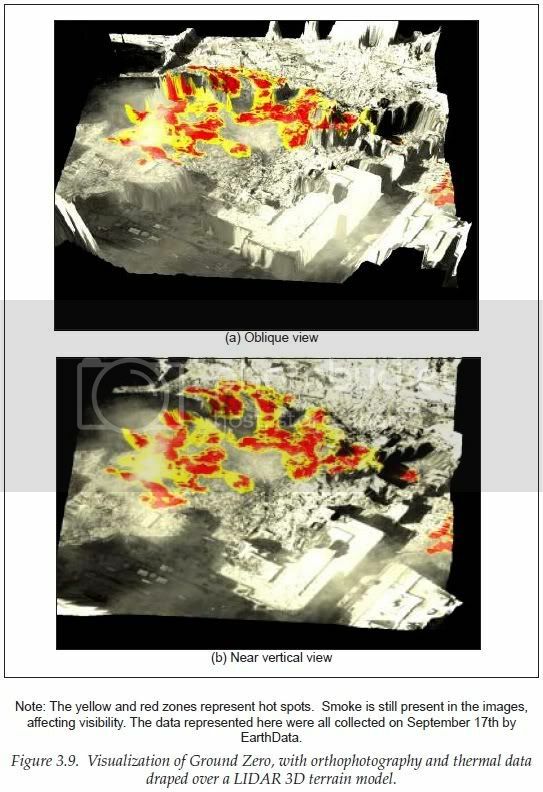 .. "The volume of debris was calculated through GIS analysis. This helped the city determine how much debris was removed. Images were compared daily to determine changes in the site." - Vince Elias, et. al., "New York District in the Red Zone," The New York District Times, U.S. Army Corps of Engineers, NY District. Vol. 26, No. 5, Fall, 2001. p. 8. G.I.S. stands for Geographic Information Systems (see for example "Mapping the Hazards to Keep Rescuers Safe," New York Times, Oct. 4, 2001). The "systems" constituted software, hardware, and people. Quickly visit New York City's makeshift OEM headquarters (that replaced WTC 7, destroyed on 9/11) in a Sept. 19 NBC News report. Notice the GIS on the wall behind Director Richard Sheirer (at 0:27). Authorities at FEMA (and the New York City Office of Emergency Management, who was already working at Pier 92 on the Hudson River in preparation for a bioterrorism exercise planned for 9/12/2001) wanted to know how long the recovery operation would take, and about how much it would cost. Since the NYC OEM headquarters at WTC Building 7 had "collapsed" 9/11 afternoon, Pier 92 conveniently became headquarters. A FEMA Disaster Field Office was established at the adjacent Pier 90 (source - note Pier 91 is on the East River). Debris management experts from the U.S. Army Corps of Engineers arrived (Allen Morse and others) and coordinated with both FEMA and city officials (source - USACE). 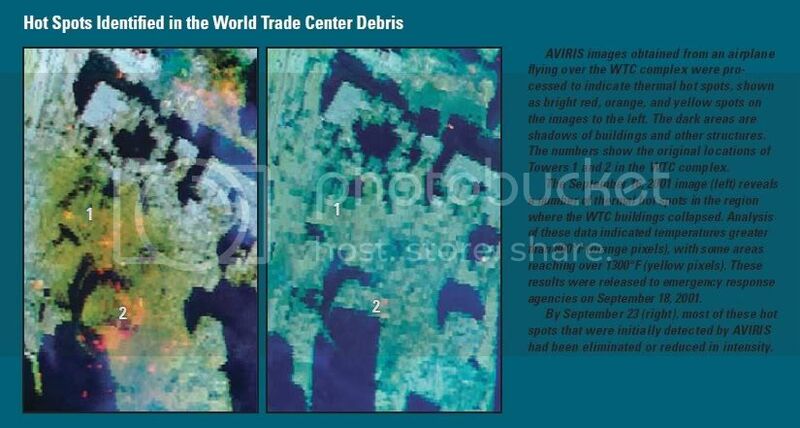 Resulting reports that detailed the calculated debris mass were published and quoted often during the "cleanup." Unfortunately their process of translating LIDAR data into weight/mass measurement has not been fully explained. Some mathematical formula not unlike cargo freight being weighed dimensionally? The resulting numbers have never been independently verified (or clarified for that matter), and so have become the subject of much speculation. Leading geographer Sean Ahearn of CARSI has not provided input on this detail; nor has FEMA or the U.S. Army Corps of Engineers. "On Sept. 23rd, 12 debris specialists started debris monitoring. USACE completed its part of the Debris Operations Plan on Sept. 23rd and turned the operations over to FEMA at the DFO [Disaster Field Office at Pier 90]. The official joint estimate of the total debris amount was released at 1.2 million tons." ("Role of USACE at the WTC Response Operations" [gwu.edu]) But what did that estimate include? Later in this book the physical measuring devices such as scales, barges, and dump trucks will be scrutinized for input, but only after gaining an understanding of the behavior of those driving the drivers.